Racing over the choppy water in your motorboat, wind in your hair, waves crashing beneath you, as you navigate the open water. Danger Boat is developer Pixelocity Software’s second game, the first being their wonderful asynchronous multiplayer racing game, Disc Drivin’ which is a staple on my iOS device and continues to get played on a daily basis. As you may have surmised from the name of the game, this endless runner boater is no casual pleasure cruise, your situation quickly becomes hazardous. Soon you’ll be avoiding rocks, mines and missiles, being tossed about by whirlpools and hundred foot swells. The goal of the game is to rack up the highest score possible through a combination of distance traveled, coins collected and accomplishing a rolling set of missions. You can also earn extra points by tempting fate either by getting really close to a passing missile, by entering a disorienting slingshot-educing whirlpool or by hanging ten on a passing wave. Don’t worry, you have an arsenal of power-ups at your disposal like a laser, shield, radial blast and even some assistance from a helicopter. By accomplishing missions, you work toward increasing your persistent multiplier This is a game mechanic that I really enjoyed in another running game, Rush City and it works quite well here too. The nice thing about this, is that as you progress through the game you don’t have to ‘last longer’ to score bigger, you can continue to do as well as you usually do, but earn points more quickly. I am a fan of this design and wish more endless runners would adopt it. The one issue I had here is that due to the randomness of the game, sometimes it can take a REALLY long time to complete the last couple of missions before leveling up. You may be tasked with something like using a particular power-up 4 times, but if that power-up only happens to come up once every 5 times then you may need to play a lot of games to finish that one mission. 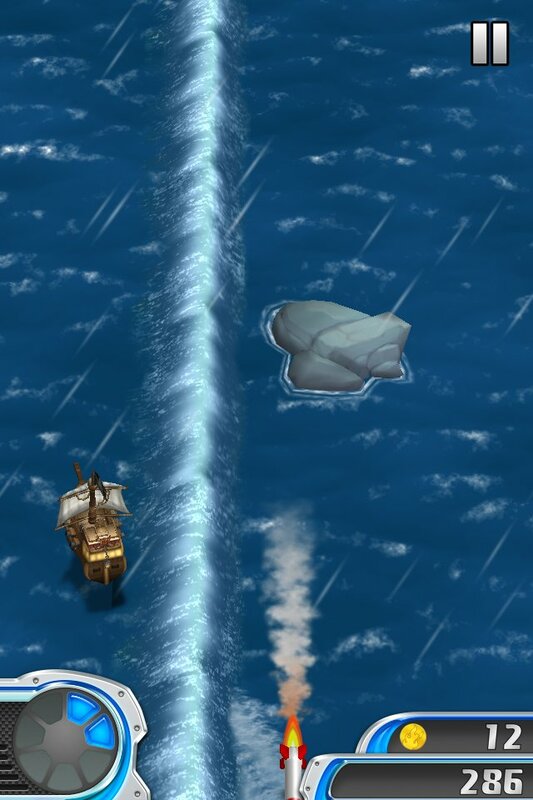 The in-game graphics are really well executed, with realistic looking moving water and the waves and harsh, stormy seas looks especially great. The ambiance set by the crashing wave sound effects and Whitaker Trebella’s Hawaii Five-O-meets Magnum PI theme song completes the experience nicely. The game’s physics and controls are rock solid. Just the slightest tilt of your device and you can be dodging rocks like a seasoned stuntman. If there is wave coming at you while navigating a narrow path between rocks or taking a leap off a ramp, you’ll need to make the proper course correction otherwise you’ll soon find the wave thrusting your doomed craft into the business end of of a jagged rock or into the path of an oncoming missile. Pixelocity’s boat driving experience is free-to-play with the core game costing you nothing to enjoy. Paid elements come in the usual form of increasing the duration of power-ups, getting one-use head starts and second chances, alternate boat types like a big pirate ship (purely cosmetic) and a different looking home base. While the cost of admission may be free, earning enough coins for the some of these upgrades will take a many hours of gameplay. Those in a rush do have the ability to purchase coin packs for real money. 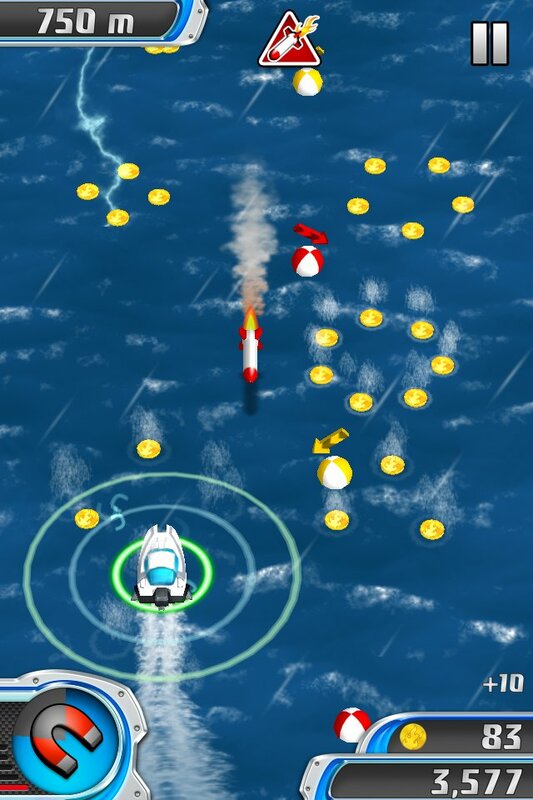 Danger Boat is a fun, free pickup and play game with some unique and well-executed wave physics. However, aside from the ubiquitous Game Center leaderboards, the game is missing that special hook to keep me coming back for a long time. 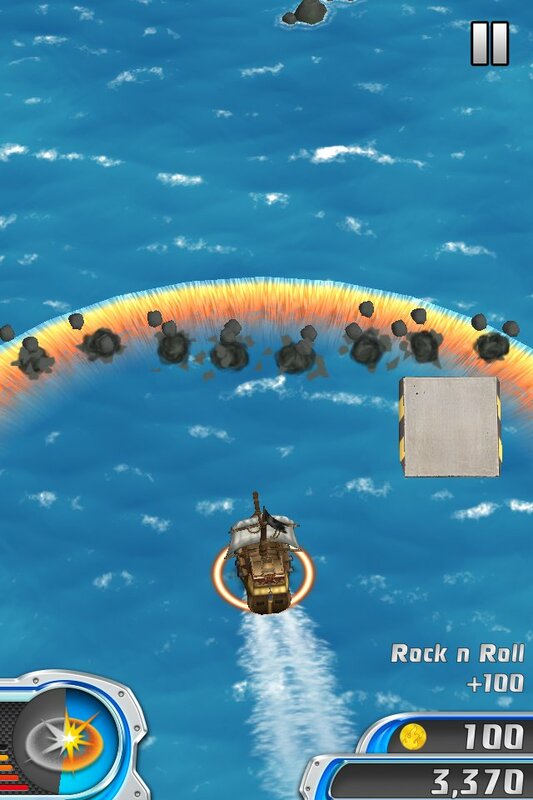 While I don’t see Danger Boat becoming part of my daily schedule (like the oh so addictive Disc Drivin’), it is a fun go to title that can be pulled out whenever you have a few minutes to kill. This is one boat trip that is definitely worth checking out.